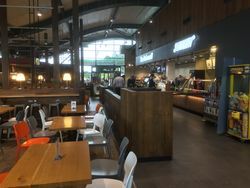 As part of Applegreen's expansion plans, they opened this new service area besides the relatively quiet M11. The service area was privately developed to try to stop Gorey being developed by Transport Infrastructure Ireland, further down the M11. It opened on 4 June 2014, giving it a five-year monopoly before Gorey finally opened. It's built in a large cutting on the site of the old Cullenmore Hotel, which closed as part of the road upgrade in 2002, and was then burned down in 2011. As it is the old N11, there are some private driveways along the entrance to the services. Parking is provided for 80 cars, 6 HGVs and 3 coaches and the investment was approximately €7m. The main amenity building is not open overnight, but 24 hour toilets are provided along the side of it. During planning the proposal was referred to as 'Coyne's Cross services'. 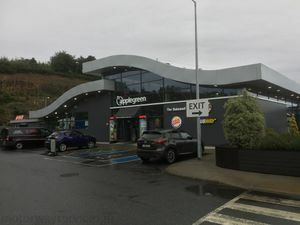 When Applegreen opened it, they clearly filled it with signs calling it 'Wicklow service area'. However in 2019 Transport Infrastructure Ireland provided new signs at the end of the M11 which refer to services at "Coynes Cross".